4-Word Review: Psycho stalks blind girl. 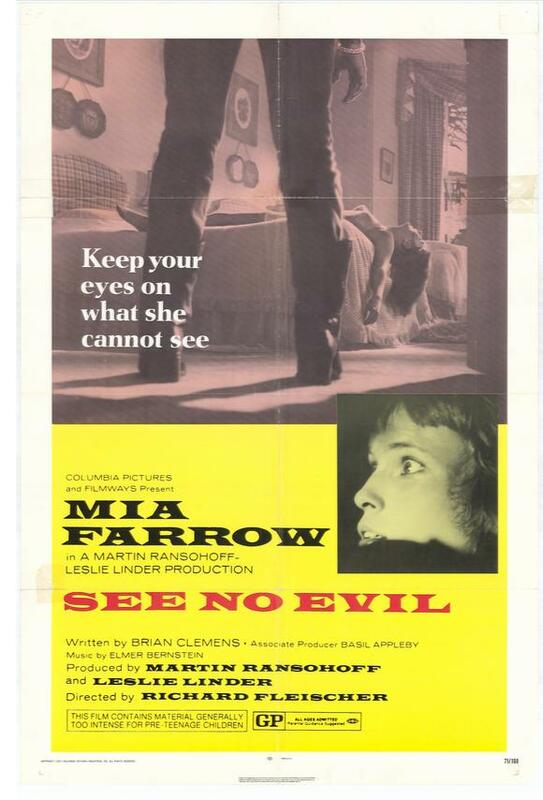 Sarah (Mia Farrow) is a young woman who becomes permanently blinded during a horse riding accident. After months of rehabilitation she returns to her family home in the English countryside. Dealing with her new handicap is awkward at first, but things go genuinely smoothly. Unfortunately a psychotic man harboring a petty grudge lurks in the shadows. One day while Sarah is away he murders her entire family and when she returns he goes after her, but the viewer is as in the dark as she is to his identity as all that is shown are the nifty looking cowboy boots that he walks in. Veteran director Richard Fleischer takes Brian Clemens compact script and turns it into a visual masterpiece. The camera angles and shot compositions are not only perfect, but highly creative. One of the highlights is when Sarah comes home and doesn’t realize at first that her family is dead and only slowly becomes aware of it along with the viewer. The countryside, which was shot near Berkshire, England, is majestically captured particularly during the horse riding sequences. The pace is fast and intense and never lets up with twists that prove to be quite interesting. Farrow has a limited range as an actress, but her delicate features and the character’s self-reliant nature make her easily likable and the viewer immediately becomes empathetic to her plight. The rest of the characters are well-rounded and believable with noted character actress Lila Kaye in a small, but memorable role as a gypsy mother. The fact that the identity of the killer is kept a secret until the very end is an added bonus, but you actually do see his face in an earlier scene, but are not made aware that it is him, which I thought was pretty cool. The only misgivings that I had in this area is the fact that the killer supposedly murders these people in a fit of revenge for accidently splashing water on his precious boots when they drove past him in a car, but then later after he kills them he goes to bed and allows the droplets of blood from his victims to dry on his boots while he sleeps even though I felt with his obsessive preoccupation with them that he would have wiped that off right away. Also, for a man who brazenly murders a family in broad daylight for such a petty reason he seems to get a little too nervous about it afterwards even though if he is that crazy I would think that he would have remained cocky about it and felt that he would be able to murder anyone else who got in his way. He also puts up no fight in the end when he finally gets cornered making him look wimpy and making the climax a bit of a letdown. Overall though I found this thriller to be highly entertaining and its effect has not diminished through repeat viewings. They don’t seem to be able to make them like this anymore, which is unfortunate. This entry was posted in 70's Movies, British Movies, Foreign Films, Mystery, Thrillers/Suspense and tagged Brian Clemens, cowboy boots, Entertainment, Lila Kaye, Mia Farrow, Movies, Review, Richard Fleischer, Richard Winters. Bookmark the permalink.